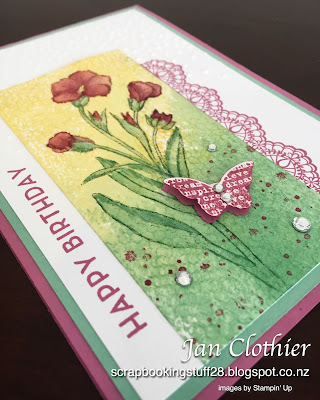 Today's card is inspired by both the sketch at Freshly Made Sketches and the colour challenge at a brand new challenge, Colour INKspiration. If you are interested in playing along, their page is here. 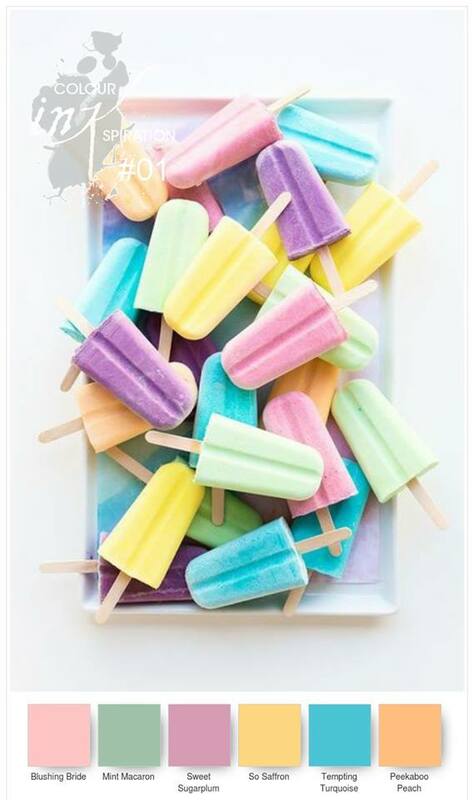 Very kindly, the colour challenge rules this time let us play with a minimum of three of the colours. I've used Sweet Sugarplum, So Saffron, Mint Macaron and the tiniest traces of Blushing Bride. 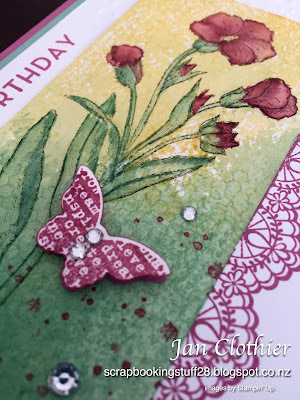 To create the centre panel, I used an acrylic block to stamp the background colours, stamped the outline of the stamp in half strength Staz-on, then watercoloured the image. I added in some additonal textures with the netting stamp from Butterfly Basics and with Timeless Textures before adding the layered butterfly and a few rhinestones. I partially embossed with the Softly Falling folder so that the dots didn't come too far down the card front and I like how they're a bit like falling rain on the flower. So this card is a mix of old and new. The lace edging is from Delicate Details, a Sale-a-bration item, while the greeting is from Big on Birthdays, available in the new Occasions catalogue. But the centre image is from one of my most used sets, Butterfly Basics - still available from the Annual Catalogue. Other: Aquapainter, rhinestones, Itty Butterfly punch, dimensional, Stamp'n'Write marker - Mint Macaron. 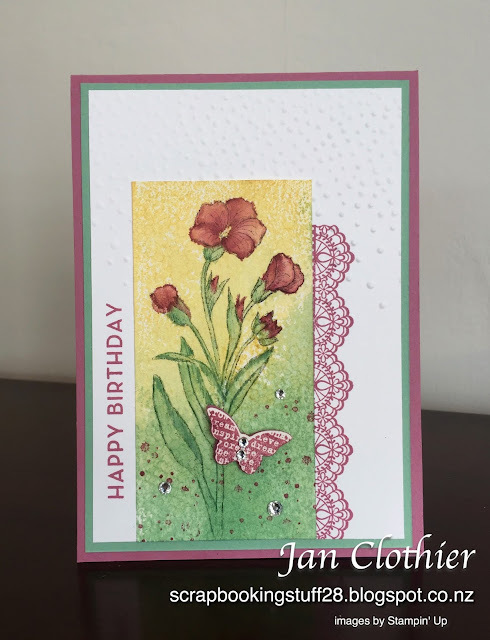 Love what you've done here Jan, absolutely everything from the watercolour background to the lace edge (& everything in between)!!!! This is so pretty! Love the sweet flowers and butterfly! Glad you joined us at FMS! Jan this is stunning. Your watercoloring is beautiful. What a beautiful card! I love that central panel you've created. That flower is gorgeous! Thanks for joining us this week at Freshly Made Sketches!